The Funeral Service for Cardinal Desmond Connell in the Crypt of the Pro Cathedral in Dublin, officiated by Archbishop Diarmaid Martin. Pic John Mc Elroy. Eucharist was central in Cardinal Desmond Connell’s teaching and Eucharist was central in his life, Archbishop Diarmuid Martin said at the solemn funeral Mass in St Mary’s Pro Cathedral on Friday morning. 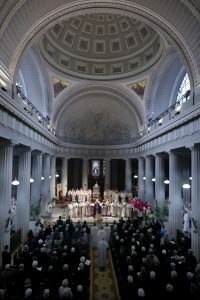 Addressing mourners, including relatives of the Cardinal, 24 archbishops, bishops, as well as members of the Dublin diocesan clergy, members of religious orders and former staff and carers, Archbishop Martin said they were gathered to “bid our farewell in this earthly life to Cardinal Desmond Connell”. Archbishop Martin said the Cardinal’s love for priests sprang from his deep respect for those whose calling and ministry it is to celebrate the Eucharist and to bring the Eucharist as nourishment for his flock. He said that faith in Jesus Christ is more like the struggle of knowing a loved one and experiencing each day the struggle between the richness of that love and the realisation of our own failings and inadequacies. Cardinal Connell struggled in his thought and in his seeking for Jesus. 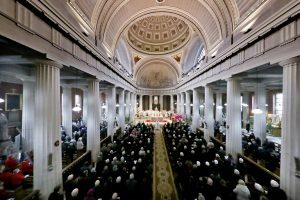 The Funeral service in the Pro Cathedral in Dublin for Cardinal Desmond Connell officiated by Archbishop Diarmaid Martin. Pic John McElroy. He also highlighted that Dr Connell never sought ecclesiastical office but when called to office he gave his best. Dr Martin said God had given Cardinal Desmond Connell the gift of a long life. The former Archbishop of Dublin died in his 91st year, after almost 65 years a priest, almost 29 years a bishop and a cardinal for 16 years, that anniversary falling on the very day of his death. Speaking about the role of a bishop, he said they are called to carry out so many functions that it could easily be overlooked that a bishop is in the first place a preacher and a teacher of the word of God. Describing Cardinal Connell as an “untiring preacher”, he noted that he had written over 20 pastoral letters, all focused on what is most central in the life of a Christian and the Christian community. Cardinal Connell, he said, was a man of prayer, that deep prayer which sought to understand the profundity of the mystery of God’s love which is revealed in Jesus Christ. Addressing the clerical abuse crisis, he said Cardinal Connell became Archbishop at a difficult time in the diocese. Many comments in recent says had noted that he was slow to recognise the extent of the problem of child sexual abuse by priests. “It is not enough to make that comment now from a distance. It must be said that he found himself surrounded by a culture and at times by advisors who were slow and perhaps even unwilling to recognise both the extent of the problem and the enormous hurt that had been done to children, a hurt they still carry with them. That hurt has still to be fully recognised; that wound cannot be consigned to past history. For victims it still remains. Funeral Mass of Cardinal Desmond Connell in the Pro Cathedral in Dublin. Pic John Mc Elroy. “It is also true that it was Cardinal Connell who was the one who finally began to realise the extent of the abuse and the extent of the damage done to children and with difficulty began to drag out information which some were still reluctant to share. “He must be remembered as the one who established the child protection service in this diocese, which was the beginning of a new culture which has now, thank God, been widely accepted and welcomed. He also highlighted that Cardinal Connell is remembered by many as an academic and a speculative philosopher and that his philosophical ability was constantly penetrated and challenged and made reality by his deep faith. Acknowledging that Dr Connell was not a politician or a vote seeker, he admitted that his predecessor may have been, at times, insensitive in things he said, but not out of malice. In St Mary’s Pro Cathedral, the Cardinal’s coffin stood before the altar and the symbols placed on his coffin included a pall, a book of the gospels, a cross, a stole and mitre. 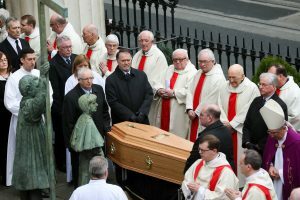 The chief mourners included the late Cardinal’s sister-in-law, Peggy; his nephews John, Denis and Mark; as well as grandnieces, grandnephews, a wide family circle, and his carers. The Mass was concelebrated by Archbishop Diarmuid Martin, Archbishop Charles Brown, Archbishop Eamon Martin, Archbishop Michael Neary and Archbishop Kieran O’Reilly. 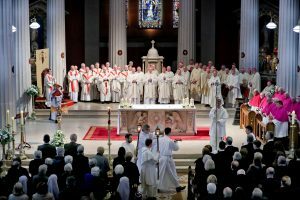 They were joined by other member of the Irish Bishops’ Conference, the Dublin Metropolitan Chapter, priests, religious, deacons and lay faithful of the Archdiocese. The Palestrina Choir under the direction of Blánaid Murphy and organist, Professor Gerard Gillen, included the following music in the liturgy: Mozart’s ‘Lacrimosa’; ‘Agnus Dei’ by Palestrina; Mozart’s ‘Ave Verum Corpus’, and ‘Requiem Aeternam’ in plainchant. The readings were read by John Connell and Marcus Heather, nephews of the late Cardinal, while the prayers of the faithful were read by Dr Eileen Kane, a retired lecturer in history of art at UCD and a friend of Cardinal Connell. 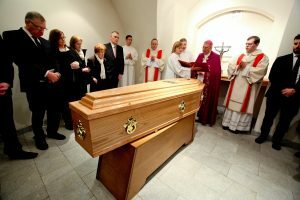 Cardinal Connell was laid to rest following a final commendation and farewell in the Crypt of St Mary’s Pro Cathedral. Speaking after the funeral Mass, the Papal Nuncio Archbishop Charles Brown recalled how he had first come to know Cardinal Connell through his role at the Congregation for the Doctrine of the Faith (CDF). After he retired from the CDF, Archbishop Brown did not see him again until his own appointment as nuncio to Ireland. Asked what he thought Cardinal Connell’s greatest legacy to the Irish Church was, the Papal Nuncio said it was Cardinal Connell who took the first steps towards resolving the abuse crisis. Bishop Brendan Leahy of Limerick, who served as a priest in the archdiocese of Dublin under Cardinal Connell, told CatholicIreland.net that he was “very warm and very encouraging to me as a priest”. Bishop Leahy said that “He had a humble spirit and was anxious at times about doing the right thing. That must have caused him terrible personal pain when he had to deal with very complex, difficult situations. I think he did have a lot of anguish about that. “We could see at the time he was under pressure – you could see it visibly in his face, that he was bent low by the weight of it. We could see that there was something worrying him deeply. A survivor of clerical abuse, Mark Vincent Healy, said he attended the funeral to “see how a prince of the church is honoured and respected as he departs this life. “I was thinking of those who also are princes and princesses of the church who should be leaving this life with the same dignity,” he said of other victims of clerical abuse. He had never met Cardinal Connell. But he said Archbishop Connell was influential in his own life because of a connection with his own abuse case. However, Mr Healy suggested that he would like to try to move forward. “But moving forward is not to forget things – moving forward is to actually achieve something out of all of this and there is still so much work to be done for survivors. There is a lot of suffering out there still. Cardinal Seán Brady said he was saddened by the news of the death of Cardinal Desmond Connell.